Okay, go back with me to a film you might remember “Willy Wonka and the Chocolate Factory”. (It was a book by Roald Dahl first, but who’s counting?) I’m going to a specific scene and a song. Veruca Salt, the spoiled little girl who gets removed from the factory as a “bad egg,” sings a (fairly obnoxious) song before being whisked away down a tunnel to goodness knows where. I want to wrap it all up in my pocket. It’s my bar of chocolate. 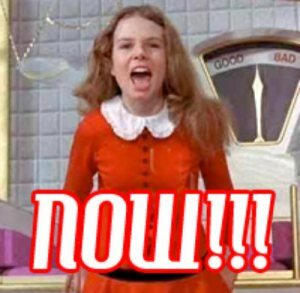 I realized the other day that when it comes to our operations at Gulfshore Playhouse, I was becoming a little like Veruca Salt. I want so many things for us. Things we definitely need, and things we are on the brink of obtaining. -A new building. One with all the bells and whistles. Seating and a fly system, for a start. -A new administrative office. One with walls. And desks for everyone! One where there are individual phone lines for each employee. I could go on…but my Veruca is showing. Where did Miss Salt’s unbridled greediness get her? Down an undetermined-destination rabbit hole of ungratefulness and ridiculousness, that’s where. Mr. Dahl, I’ve learned my lesson and I’m changing my tune! All of us have things that we want, need, or desperately desire. It’s part of the human condition, unfortunately. But whenever I get to this point, I remember the little things and remind myself that contentedness leads to a much happier experience all around. I’m so proud of our bursting-at-the-seams organization. We have so much potential and we are a strong little army of brave and fearless artistic adventurers. I feel like I need to make a new list now. One of all the things I’m grateful for. Let’s start, shall we? -A job in this weird, exciting arts world. Love it. -A whole lot of heart in this place and acceptance for the fact that I might burst into songs from Oliver! as an example of loving the small pleasures in life. I want the whole works…and now. I’m happy living in Nancy’s view from Oliver! For the likes of such as me. We are pulling ourselves up by our bootstraps. We have grown SO quickly over the past ten years, and we continue to build a strong foundation on high-quality art for our patrons. One day we will get to my first list, but until then, I am incredibly grateful and content to have what we have, to be doing what we do, and to know the people I get to do it with! And, you know, mine IS a fine, fine life.